Big industrial firms may have a lucrative portfolio of salable surplus properties but rarely put their disposal on the C-suite agenda. CFOs of large industrial companies may be sitting on a gold mine that they rarely think about. As counterintuitive as that may sound, such companies are likely to own real estate properties that are ripe for disposal — from a few dozen to hundreds or, in extreme cases, even thousands of them. And with demand for industrial facilities rising, it’s a sellers’ market. Arcadis, a design and consulting firm for environmental, infrastructure, buildings, and water projects, recently spoke with 33 large industrial companies across 12 industries. Only six of them said surplus real estate disposal was prioritized at the executive level. Almost half (47%) delegate the task to environmental or real estate personnel who may not hold ultimate authority for property disposal. And 25% reported that disposal of multiple properties was not a management priority at all. Under-prioritizing the issue is a mistake, according to Mark Fenner, a senior vice president at Arcadis. “Companies we work with that have this on the executive committee’s agenda are more progressive and more able to effectively dispose of surplus properties,” he says. Properties become disposable as a result of, for example, plant relocations, shutdowns of obsolete facilities, or operational consolidations. Many companies find themselves with a new crop of such properties following M&A transactions. Research by Arcadis indicates that surplus real estate typically remains dormant for about 20 years. Management may believe they are sitting on appreciating assets, or they may feel trapped by real or perceived risks associated with a property, such as environmental remediation. Some misunderstand the costs of holding onto property and the potential value locked within, according to Arcadis’ survey report. 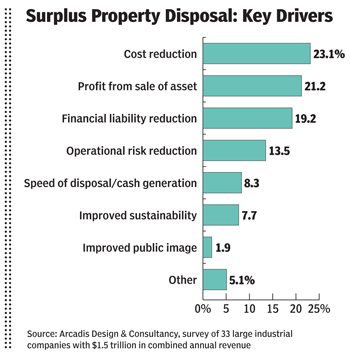 Benefits of property disposal range from higher profits and reduced liabilities to healthier balance sheets and enhanced reputation, Arcadis says. However, few generalizations can be made insofar as quantifying the effect on company financials. Proceeds from sales of assets vary, of course. To some degree, an impact on company financials can be quantified from a book-value standpoint, but that depends on the age of sold properties and other factors. The chemical company Fenner mentioned above made a decision years ago to write-down its surplus properties, so their book value is low. Other companies keep a higher book value. Another variable is the amount of environmental reserves on a company’s balance sheet, which range up to hundreds of millions of dollars for many large industrial firms, Fenner says. From a pure cost standpoint, more than half (54%) of the surveyed companies said carrying costs for their portfolios of surplus properties exceed $5 million per year. Components of the tab include compliance, permits, licenses, taxes, utilities, security, and site maintenance. As to the demand for such properties, the vacancy rate in the U.S. industrial property market fell significantly from the beginning of 2016 through the first quarter of this year, from 6.1% to 5.4%, according to Arcadis research. Fenner attributes the trend largely to the overall strength of the U.S. economy. Another factor is that some manufacturers are moving production back to the United States, influenced by variables such as technology innovations, the high cost of transporting goods, pressure from the Trump administration, and risks associated with foreign manufacturing. Further, the global surge in e-commerce activity is driving demand for warehouses located near freeway intersections and fulfillment centers close to large populations. Elevate the property-disposal issue to the executive level or C-suite. Empower a senior leader with the authority to dispose of surplus property. Set a clear divestment plan with an exit strategy. This means setting a well-defined time frame for disposing of the existing surplus, such as five years. Adopt a portfolio strategy. Selling surplus properties individually is slow and costly, Arcadis notes. Sell environmentally contaminated property. Several conditions make it easier to do so today: (a) most environmental regulations are mature and well understood; (b) few significant new regulations are being issued; (c) federal agency enforcement practices are well known and predictable; (d) there is a low incidence of surplus property buyers returning environmental liabilities to the sellers. Profit should not be the sole motive for surplus property disposal. When firms focus more on timely and effective disposal, they are more likely to reduce their portfolios rapidly, lower total cost of ownership significantly, and enable leadership to focus on core issues, according to Arcadis.